Because I know many people enjoy looking at the wildlife photos I post, this thread will be an ongoing repository of some of the photos I get from my game camera. Some days there is nothing worth posting as the photos might only have part of the animal showing, be too dark, or blurr because of movement. Other days, I do get some good shots. Right now the camera is 5 yards south of my mineral station located at the stump in the photo. Be sure to check this post regularly to see any new photos. Enjoy! Last edited by FireCloud on Thu May 13, 2010 9:56 pm, edited 1 time in total. Haven't gotten much worth posting from my game camera in the past few days. Here are a couple from this morning. The twins, Andy and Alice, visited my mineral station this morning and hung around for about 20 minutes. I got 13 photos of them. Here are a few the better ones. Andy is the one at the stump. Alice did not actually use the mineral lick and spent most of her time hanging back near the trees. Since I am not intelligent enough to figure out how to defeat the 3 photos at a time limit, here are some more photos of the twins from 4:30 AM today. Plus one of the same racoon that stops here every night that rolls around, rain or shine. Trying something new to give you access to a few more pictures. Hope it works. Here are photos from the last two nights at my mineral station. The deer are visiting regularly, sometimes in groups. Great pics! Do you know what the red light is on her left ear in 3 of the pics?? we usually don't see fawns on camera on our place, till very late june, early july. BIGERN76 wrote: Great pics! Do you know what the red light is on her left ear in 3 of the pics?? I imagine it's some type of bug ... why it's lighting up I have no idea. Wonder if the cold winter we had knocked some insects down alittle bit , early on anyway ? I can answer the question about the small bright red "bug." The small, bright red looking spots on the ear of the deer is NOT an insect. It is a "bug" alright, but one that is in the camera's photo recording software. This bug is known as "data loss" which unfortunately occurs in most photos taken by this cheap $50 Bushnell camera. Data loss occurs when some of the pixels are dropped or otherwise not recorded by the camera. If you enlarge the original image about 400% to 500%, you will see a small white square that is completely empty. It simply is blank and has no data in that pixel to display. Since a human eye cannot resolve such incredibly small details clearly, our perception that we are seeing something red with a bright center is caused by our eyes "blending" the colors in the surrounding pixels with the white square that is empty. Data loss occurs to some degree in virtually all digital imagry. Many cheap game cameras are operating at a low 1 megapixel level or possibly even less. By comparison, a typical hand held digital camera sold in stores today might have 7 to 10 megapixel resolution. When there fewer megapixels, any data loss often produces the little white spots like what you see in my photos. 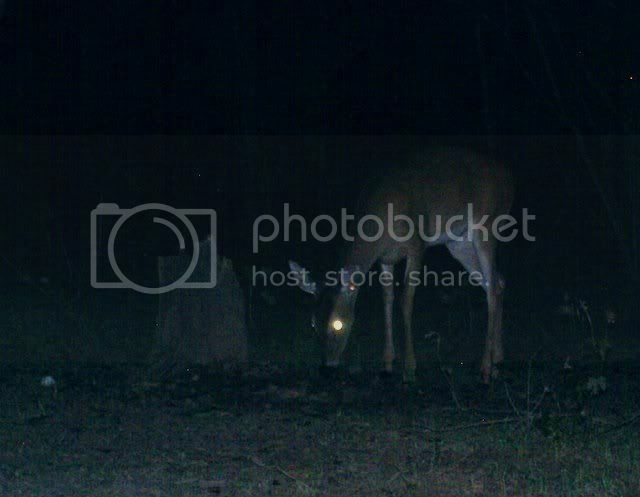 Data loss is not normally noticed in a daylight photo but is readily noticed in night photos as a white blank pixel shows up readily against a black or dark background. If you look closely at the photo of the three deer, you will see some other small white spots at various points near the deer's heads. And you may also see some similar spots in other photos I have posted. It is simply the quality you get from a cheap game camera. For those who are interested in wildlife photography, one of the reason homebrew cameras are so popular is that the cameras used in those systems are regular "off the shelf" high quality name brand cameras, such as Sony or others, which typically are at least 3 to 5 megapixel cameras. In fact, some homebrew systems allow you to take the camera out and use it as a normal hand held when you are not taking game photos. The quality of the cameras used in homebrews and the resulting higher resolution images it will take is superior to most of the lower cost game cameras on the market today. Another factor is the lens used on game cameras. In photography, len quality is critical to getting the best pictures. Lens need good light gathering ability, need to be distortion and defect free, and need to be of the highest quality for best results. When you only pay $50 for the whole camera, the lens is probably a $2 part, if that. And it has to shoot through a plastic weatherproof cover. Overall, the lens on a cheap game camera are about equal in quality to the lens on a pair of cheap sunglasses. Its a wonder the cheap cameras even get a decent photo at all. Most homebrew cameras originally retailed when new for $200 or more and have FAR better lenses on them. Game cameras are fast improving however and much higher resolution cameras that will take good photos are available at higher price points. So if you want the very best possible game photos at a fairly reasonable cost, homebrews or higher quality game cameras are the way to go. But you have to be willing to tape a few hundred dollars bills to a tree and accept the risks that come with it to get those better game photos. For me, I am happy enough with a cheap $50 camera and some photo editing software. I can easily edit out any of the data loss pixels but simply don't spend the time to do so for the photos I post here. Under decent conditions, a $50 game camera will take some pretty impressive photos. 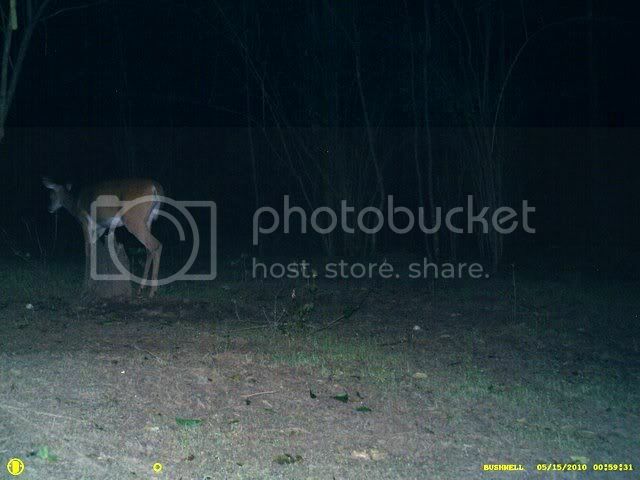 Here are some taken recently by this same camera mounted on the same tree of Eve, a doe that visits my mineral station. I consider them to above average quality images considering the equipment used. Based on the many hundreds of photos I have captured and the behaviors of the individual deer, I have two does that I believe are carrying fawns. 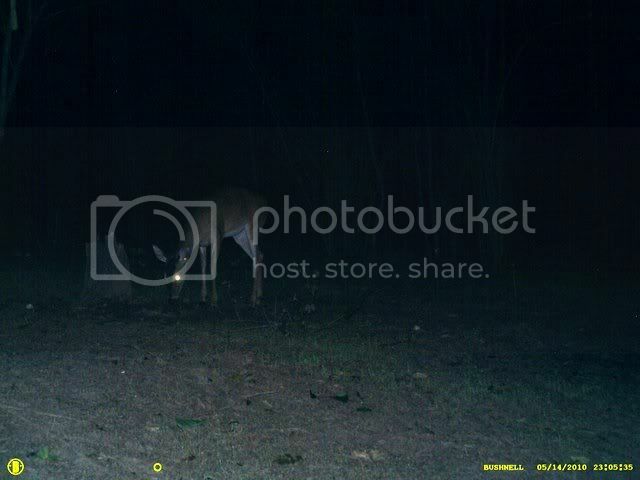 The doe in the last photo posted which was taken on 5-15-10 almost certainly is carrying a fawn. That deer, I believe, is Eve, a young doe who is probably carrying her first fawn. I have a number of photos of Eve actually using the mineral lick. Typically, does who are about to give birth will use a mineral lick just as bucks will when starting to grow antlers. The deer who ordinarily DO NOT use a mineral lick at this time of the year, per scientific studies, are yearling does that were not bred their first year or very late dropped bucks who are just too immature. All other bucks and does will likely use the lick. My photos show this to be exactly the case at my station. 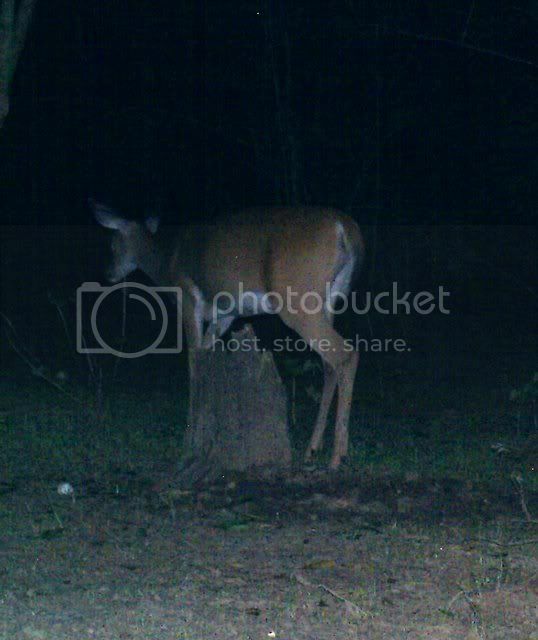 I have a young buck that never uses the mineral lick, named Jack, who is shown standing alone in the photos of 5-13. He is a small, thin, buck that is much smaller and obviously younger than the other bucks born last year. I have plenty of photos of Jack following his mother, Daisy Mae to the mineral station but not a single one of him using it. He just stands and watches all the other deer use the lick. 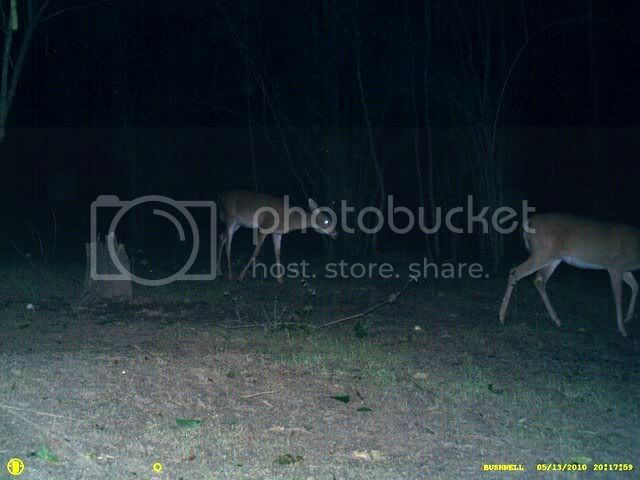 You can see him standing at the rear in the photo of the three deer taken on 5-13. His mother, Daisy Mae, hits the mineral lick fairly regularly. Since she has already had her first fawn, she is likely carrying two fawns now and is using the mineral lick because she is about to about to drop in a month or two. I have separate photos of six deer that regularly visit my mineral lick, and two sets of photos that show three and four of these deer at the lick together at various times. 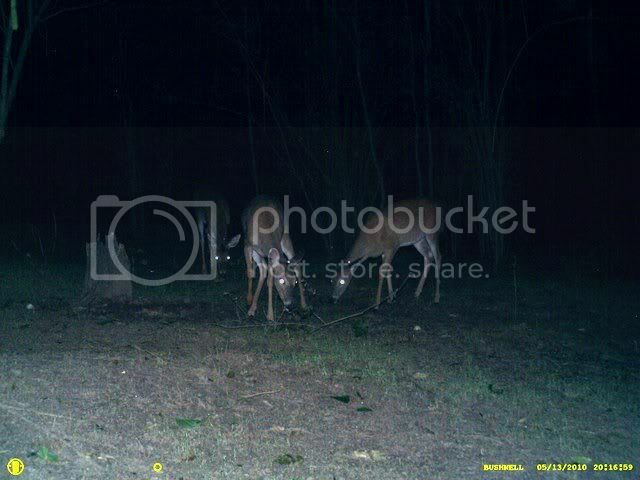 Of the six deer that hang out here on my land, three are young bucks. They are Little Joe, Andy, and Jack. All of them were born last spring. The three does I have here are Daisy Mae (2 or 3 years old,) Eve (1 or 2 years old), and Alice who was born last spring. I believe both Daisy Mae and Eve are carrying fawns and am expecting to get photos later this year of 2 or 3 newborn fawns. Alice has also never used the mineral lick but simply watches the other deer use it. Thus, I do not believe she was bred this last season. 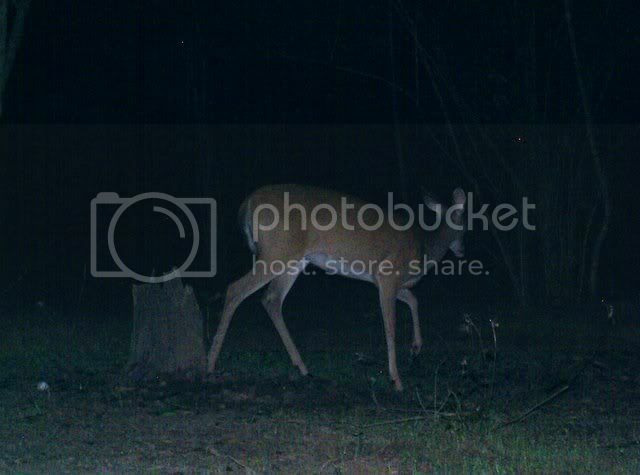 Of the photos I posted which were taken on 5-15, the first three of them are of Little Joe, a nubbing buck. 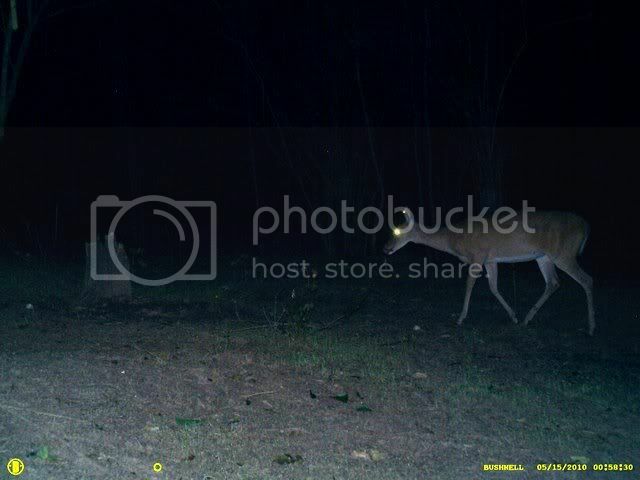 Little Joe is NOT the same deer that is shown in the very last photo taken on 5-15. Little Joe arrived at 12:58 AM and I posted both of the original photos I got of him plus a cropped close up. Eve visited at 3:48 AM but the time is cropped off in the photo of her that I posted. It is difficult to always be 100% certain of exactly which deer is in a photo. However, I have created a set of "deer profiles" and with mug shots, left, right, and rear photos, as well as photos of any unique identifying features. With the records I have maintained about these deer, such as their typical movements, their social structure, and other observations, I can usually identify these deer correctly. Believe it or not, if you really study deer closely, over time you can distinquish minor clues that will help you identify various deer. For example, Alice has a small white streak down her nose, like a "blaze" on a horse. 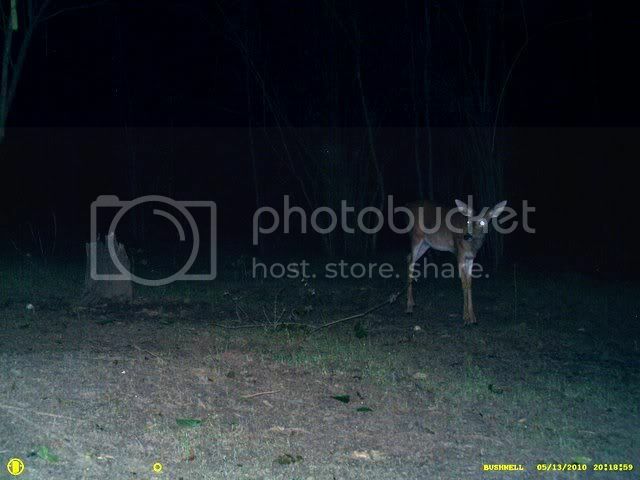 None of the other deer I have photographed have this same streak. The twins, Andy and Alice, are always together, are of the same age and size, and are easy to spot as I have no other pair of twins on my land. Jack always follows behind Daisy Mae, and that is also an obviously easy combination to identify. Eve's forehead has a streak of black hair with white hair outlining both of her eyes. Thus if I see a nubbin buck visiting my mineral station alone that is of the age and size as Little Joe, it is likely him. He also has a few other identifying traits and habits. He is a corn junkie and visits several times per day when I have my corn feeder up. He similarly loves the mineral lick and visits it very regularly. He is a larger framed deer and is really fattening up. Little Joe is going to be a "big boy" which is why his large, fat belly might makes him resemble a doe carrying a fawn. But a face on shot will show his nubbin points. Here is a photo of Daisy Mae and Jack together. You can readily see Jack's nubbing points if you enlarge the photo.